"ClinTrial Refer has certainly made our jobs a tad easier on one level, the information is at our fingertips for other participating centres, its a great networking tool and has decreased the silo effect of clinical trial centres." "ClinTrial Refer is an innovative tool that brings together clinicians, researchers and patients. It enables clinicians and patients to quickly access the latest information on clinical trials so together they can make informed decisions on the best treatment options available. Clinical trials are vitally important to patient care. Researchers are constantly striving to find answers to improve the quality of life of our patients, ClinTrial means better and faster access to their work." "ClinTrial Refer Oncology NSW provides convenient clinical trial information at the fingertips of doctors and research staff in our busy oncology research unit. The app facilitates a discussion of treatment options that includes clinical trials at point of consultation with patients. It has enabled increased cross referrals of patients resulting in faster accrual to meet recruitment targets. I recommend ClinTrial Refer Oncology NSW as a great tool for clinical research. " "Rural patients in the Central West will have increased options available. This app and website will assist in keeping local GPs informed about clinical research trials in local facilities, rather than sending them straight to major cities. The Orange Health Service is devoted to improving access to clinical research." "ClinTrial Refer is one of the most welcome additions to my clinic in recent history. As a rural general oncologist who looks after several hundred patients across 9 tumour streams it is impossible to stay abreast of all the open and pending clinical trials. I dearly do not want my rural patients to miss out on key trials testing novel molecules and I use ClinTrial Refer on an almost daily basis to interrogate the clinical trial landscape. Only last week I emailed a Trials nurse in Sydney about a patient and was kindly directed to another clinical trial they were running which was better suited for my patient as it was an oral drug instead of an intravenous drug. 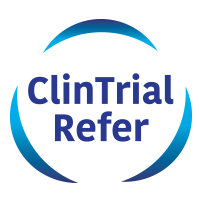 In short, ClinTrial Refer is a trusted and reliable source of information and has become a critical tool in my clinical practice." "Lymphoma Australia feel very proud that we have been able to fund the ClinTrial Refer website. This platform will give lymphoma patients the opportunity to look for clinical trials relevant to their lymphoma subtype. Hopefully this knowledge will give patients and their families more options about possible treatments and ultimately lead to better outcomes." "The App is simple and effective, as most brilliant ideas are." "ClinTrial Refer Melanoma has been essential to ensure my colleagues have up to date information regarding the clinical trials we have open for patients with melanoma. It is easy to use, and contains all the essential information and links required to quickly review clinical trial options for patients." Welcome to ClinTrial Refer! Use the below link to subscribe to our mailing list to stay connected.